Repeated examination may be conducted in Serebrennikov embezzlement case | Russian Legal Information Agency (RAPSI). 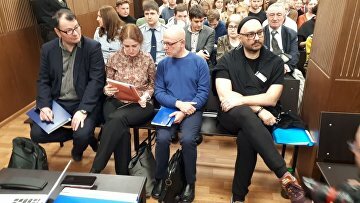 MOSCOW, April 12 (RAPSI) - Moscow’s Meshchansky District Court will deal with a matter of commissioning a repeated comprehensive expert examination as part of the embezzlement case involving the Gogol Center theater director Kirill Serebrennikov on April 15, RAPSI reports from the courtroom on Friday. The repeated comprehensive expert examination is the court’s initiative. Prosecutors insisted on the second economic study while the defense petitioned for a cultural and social evaluation.